First, there was Dark Lord Day. Sounds ominous but it’s the one day a year when Three Floyds Russian Imperial Stout is made available to the public. Eight-thousand or so lovers of brew descended on the brewery in Northwest Indiana. Good times, good times. Next, my foodie pals from Chicago Bites stopped by the French Market on the day the Mayor of Paris paid a visit. This prompted a search the for the best croissants in Chicago dubbed CroissantQuest2010. I have fond memories of my first time on Paris, living on the cheap. Freshly baked, flaky and buttery croissants along with cheese and a piece of fruit served as a great way to start the day. I want to relive at least that part of my youth, calories be damned! 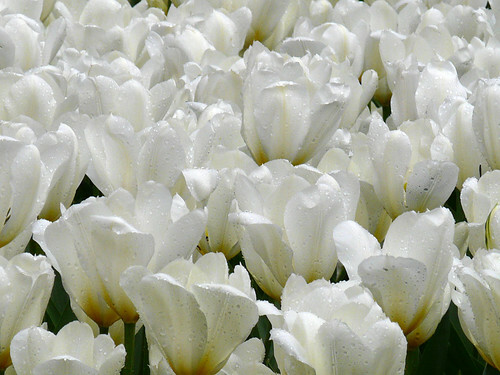 Since I had to walk along Michigan Ave on my way to the first bakery, I stopped to take a few pictures of the tulips dressing up the flower beds between the Tribune Building and Water Tower Place. Aren’t they lovely? In between the outdoor fun, I did manage to finish 24 crochet squares for a baby blanket to be donated to charity. The squares are laid out and just waiting to be crocheted together in the next few days. Look for a post detailing that later in the week, at which time I will also show you a DIY project involving neoprene, flowered fabric and Velcro. You will be wowed at my ingenuity (::tongue -> cheek::). Hey, you were at Dark Lord Day, too?!? We managed to eat lunch in the brewpub, but it was so darn busy this year that I’m not sure I’ll be back next year. Last year wasn’t quite as mobbed (but I experienced more speed metal). Best of luck with the surgery, and can’t wait to see how the crochet squares come together! a crochet/knit fast sounds ominous. 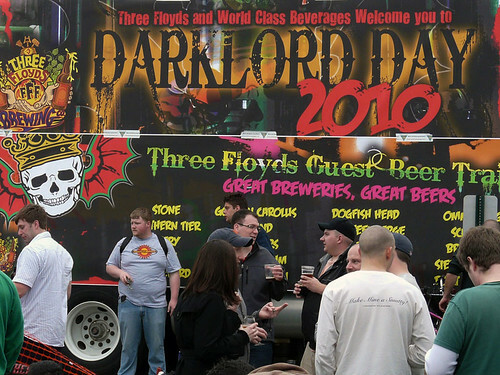 I love the idea of Dark Lord Day! Hmm. I’m mightily curious about your DIY project……..